Aerolineas Argentinas is aiming to turn around its unprofitable long-haul operation by renewing its widebody fleet, adding capacity to several existing destinations and implementing codeshares with its SkyTeam partners. The airline plans to acquire 12 A330-200s over the next four years, allowing it to replace most of its A340s – the only widebody type in its current fleet. Aerolineas remains unprofitable, an exception in a Latin American industry which has one of the highest profit margins and growth rates in the global industry. Aerolineas and its highly protectionist government owner are often criticised by more successful Latin American airline groups, with a particularly hostile backlash against Argentina taking place at the recent ALTA 2012 Airline Leaders Forum. But Aerolineas has improved its outlook significantly since renationalising and embarking on a restructuring at the end of 2008. Fixing the long-haul network remains a challenge but the airline’s management team is putting in place the right strategies to give Aerolineas a chance to turn around - and hopefully give the government the confidence to loosen its unhelpfully protective aviation policies. Aerolineas' chief commercial officer Juan Pablo Lafosse told CAPA at the ALTA 2012 Airline Leaders Forum in Panama in Nov-2012 that the carrier plans to add five leased A330-200s in 2013. The aircraft will replace Aerolineas’ four ageing A340-200s, marking the first phase in a renewal of its widebody fleet, with the fifth aircraft being used to increase capacity on existing long-haul routes. The replacement of inefficient A340s is a critical and severely delayed component of the carrier’s on-going restructuring. Mr Lafosse says Aerolineas, as part of a second phase in its widebody fleet renewal plan, aims to acquire seven A330-200s with increased maximum take-off weights for delivery in 2015 and 2016. These aircraft are intended for growth and to replace some of the carrier’s seven A340-300s. But Aerolineas will have to be patient, as the increased maximum take-off weight option on the A330-200 was only launched in Jul-2012 for deliveries starting in 2015. The new 242t A330-200 can fly 350nm further than original 238t A330-200, according to Airbus product specifications. This extended range is important for Aerolineas, as the carrier believes it enables non-stop flights from Buenos Aires to Madrid, Barcelona and Rome without payload restrictions. The carrier expects it will only be able to use the 238t A330-200s which it will take during 2013 on its shorter A340 routes to Bogota, Cancun, Caracas and Miami. As a consequence Aerolineas is now talking to Airbus about the prospects of ordering these seven aircraft, as well as sounding out leasing companies who have A330-200s on order for delivery in 2015 or 2016 with the option of selecting the increased maximum take-off weight variant. Mr Lafosse says even when the 242t A330-200 is acquired, Aerolineas will still need to retain some of its A340-300s for Buenos Aires-Sydney, which is the carrier’s longest route. But Aerolineas may eventually seek to introduce extended twin-engine operations (ETOPS) on its Sydney route, which crosses the Antarctic, if it later acquires new-generation widebodies or Boeing 777s. Aerolineas could acquire A350s or Boeing 787s in a future final phase of its widebody renewal programme. But for the medium-term the carrier is focused on acquiring A330s while retaining four A340-300s. Mr Lafosse says Aerolineas will only need two or three A340-300s for Buenos Aires-Sydney, which it plans to upgrade to daily by 2016, but is unable to reduce its A340-300 fleet to less than four aircraft until 2017, when leases on its four most recently acquired A340-300s expire. A330s have been in Aerolineas’ fleet plan for over three years. In 2009 the airline’s post-renationalisation management team first indicated it was seeking to lease A330s to kick start the renewal of its A340 fleet. At the time Aerolineas also began evaluating the 787 and A350. In an interview with CAPA in Jul-2011 Mr Lafosse had said the carrier had agreed to leases on three A330s and the first two aircraft were likely to be delivered by the end of 2011. But Aerolineas repeatedly has been unable to complete lease deals on A330s, including the agreement Mr Lafosse referred to in Jul-2011. Mr Lafosse this time is confident Aerolineas will finally be able to secure A330s and says deals for the five aircraft in the standard take-off weight for delivery in 2013 are close to being completed. The increased focus on renewing the widebody fleet comes after Aerolineas completed the renewal of its entire narrowbody fleet earlier this year. In only three years, the Aerolineas Group – which includes regional unit Austral – replaced its entire narrowbody fleet of ageing Boeing MD-80s, 737-200s and 737-500s. Aerolineas now operates 26 737-700/800s while Austral operates 20 Embraer E190s. Mr Lafosse says the group’s narrowbody operation will expand further in 2013 as the carrier plans to acquire six additional 737-800s. The narrowbody fleet plan also includes six additional 737-800s in the 2014 to 2016 timeframe, giving Aerolineas 38 737-700/800s by the end of 2016. Mr Lafosse says Aerolineas also expects to acquire two additional E190s, giving Austral 22 E190s by the end of 2016 and the group a total narrowbody fleet of 60 aircraft compared to 46 currently. The additional narrowbody aircraft will mainly be used to expand domestically, although a small amount of regional international capacity will likely also be added. Aerolineas is now pursuing a goal to double its domestic traffic within three years. Argentina’s domestic market has historically been drastically under-served by air compared to other Latin American markets. For example, on a seat capacity basis, Argentina’s domestic market is currently about half the size of Colombia’s domestic market although Argentina has a larger GDP and only a slightly smaller population. Argentina and Chile have similar-sized domestic markets although Argentina has more than double the population and has a GDP which is about 70% larger. Following the launch of three low-cost carriers in Japan earlier this year, Argentina - a sprawling geographic landmass - has become the largest domestic market in the world not to have been penetrated by low-cost carriers. 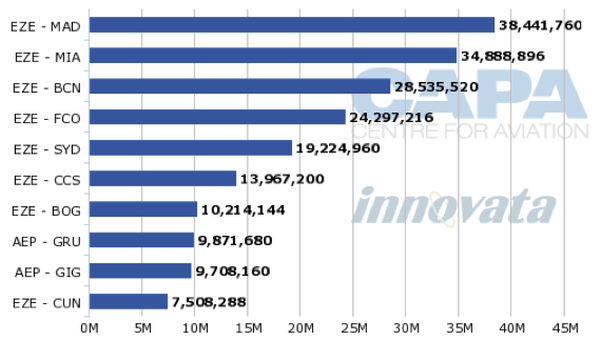 This is a result of regulation which makes it is virtually impossible for a new carrier to enter the market. LAN was able to enter the market and establish an affiliate in Argentina in 2005, while Aerolineas was in private hands and the government was irritated with the services being provided by the flag carrier. But other Latin American airline groups are now unable to enter the market and expansion opportunities at LAN Argentina, which competes against Aerolineas on most trunk routes, are also limited. The result has been to force most of the country's long distance travellers onto the long-haul bus operations, weaving through Argentina's deadly highways. This does however leave a still heavily overweight Aerolineas with enormous opportunities to expand domestically and further grow its market share, especially if the regulated fares are allowed to go low enough to stimulate local demand. Aerolineas already accounts for about 62% of domestic capacity in Argentina, according to Innovata data. In international markets Aerolineas is far less dominant and is even smaller than the LATAM Airlines Group, which was established earlier this year following the merger of LAN and TAM. 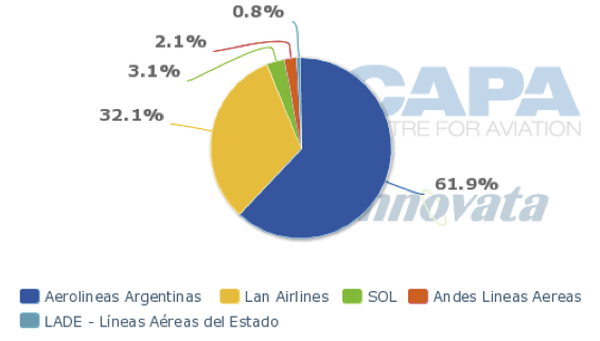 Aerolineas accounts for only 22% of international capacity in Argentina compared to 31% for LATAM, including about 22% for LAN and 9% for TAM, according to Innovata data. Counter-intuitively, this failing in international market share has become a typical outcome where protectionist policies have been applied. The profitability of Aerolineas' narrowbody operation has improved significantly since renationalisation, although it has struggled financially during certain periods, particularly in 2011 when multiple ash clouds from an erupting volcano in Chile affected operations for several weeks. But the widebody operation has been by far the worst performer and has been consistently in the red. Mr Lafosse says turning around the long-haul operation is particularly challenging given current economic conditions in Europe. Aerolineas now operates to three points in Europe, with daily flights to Madrid, five weekly flights to Barcelona and four weekly flights to Rome. “Our main problem now is Europe. Our other routes are performing much better,” Mr Lafosse said, pointing out that in Europe the carrier only serves the southern European markets of Italy and Spain, where the economies have been particularly weak. Earlier this year Aerolineas was able to offset falling demand for passengers originating in Italy and Spain by increasing sales of its European flights in Argentina. But since July Aerolineas has not been able to continue offsetting weak sales in Europe and profitability has suffered as a result, according to Mr Lafosse. 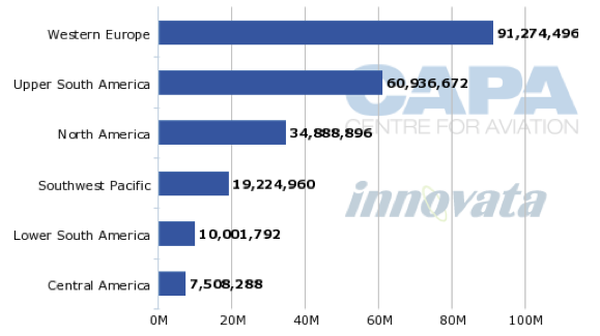 Europe now accounts for 41% of Aerolineas’ international ASKs. On an ASK basis, Madrid is Aerolineas’ largest route while Barcelona and Rome are the third and fourth largest respectively. The US market is performing significantly better, according to Mr Lafosse. Aerolineas recently doubled capacity to Miami with the launch of a second daily flight. Demand in the Argentina-US market continues to grow, fuelled primarily by outbound leisure traffic from Argentina. Performance on Miami is also expected to improve in 2013 after the first batch of A330-200s is delivered, significantly reducing fuel costs on the route. Miami is now Aerolineas’ only gateway in the US but the carrier plans to consider resuming service to New York as it expands its widebody fleet. Mr Lafosse says three to four new long-haul routes may be launched by the end of 2016, at which point the carrier plans to have five more widebody aircraft than currently. In addition to New York, Aerolineas will consider resuming service to Mexico City. (Aerolineas pulled out of Mexico City earlier this year and now only operates to Cancun, a leisure-focused route which is served with four weekly flights during the peak season and two to three frequencies the rest of the year.) London and Paris are also possibilities as they were both identified in the carrier’s initial post-renationalisation business plan. But a new long-haul route is unlikely to be added until 2015. Instead the focus for 2013 and 2014 will be upgrading all existing long-haul destinations which are not served daily to daily with the exception of Cancun. Upgrading Bogota, Caracas, Barcelona and Rome gradually to daily have been part of Aerolineas’ plans for the last couple of years. Mr Lafosse now also believes Sydney, which was not initially part of the carrier’s plans for a daily service, can also sustain a daily frequency. The Sydney operation has been profitable since Sep-2012, two months after a stop in Auckland was dropped. The main driver in improving the performance of the route, which had been a perennial loser, was the reduction in costs that resulted from eliminating the Auckland stop, particularly the cost of a second landing fee and overnighting the crew for the second leg. A small portion of passengers picked up the flight in New Zealand so the decision to bypass Auckland and start flying the route non-stop has scarcely impacted demand. Probably more importantly, Qantas also dropped its Sydney-Buenos Aires flight in Mar-2012 in favour of a new Sydney-Santiago service, leaving Aerolineas as the only carrier with non-stop flights in the Australia-Argentina market. Aerolineas is adding a fourth weekly flight to Sydney in late Dec-2012. In Jul-2012, the airline had also added one additional flight to Barcelona, Bogota, Caracas and Rome. It is now operating four weekly flights to Bogota and Rome and five to Barcelona and Caracas. Aerolineas is still planning to gradually expand all these routes by adding one additional frequency in stages until they became daily. But Mr Lafosse acknowledges Aerolineas may have to delay adding any capacity on Barcelona and Rome until market conditions in Europe improve. For Argentina's flag airline, the hope is that economic conditions in Europe will eventually improve and, by switching to more fuel efficient A330-200s, the economics of its European routes will further improve. Aerolineas’ new membership in SkyTeam should also give the carrier’s European operation a boost given SkyTeam’s strong presence in Italy and Spain. Planned codeshares with Air Europa and Alitalia should open up connection opportunities beyond Barcelona, Madrid and Rome. Aerolineas also intends to cooperate with Air Europa and Alitalia on the Buenos Aires to Madrid and Rome routes, which are also operated by the European carriers. Aerolineas joined SkyTeam in Aug-2012 but has so far implemented a codeshare with only one SkyTeam member, KLM. The carrier now expects to begin codesharing with other SkyTeam carriers serving Argentina by Mar-2013. In addition to Air Europa, Alitalia and KLM, Air France, Aeromexico and Delta Air Lines now serve Buenos Aires. Aerolienas’ domestic operation and short-haul international operation should benefit as Aerolineas starts to feed all six of these carriers. Aerolineas has already seen a significant improvement in connecting traffic after re-introducing short-haul flights at Buenos Aires’ Ezeiza International Airport. The carrier in 2010 moved all short-haul flights to Aeroparque after the downtown airport opened up to international flights to Brazil, Chile and Paraguay. Aeroparque was already used for domestic flights and flights to Uruguay but Aerolineas until 2010 also operated some domestic flights at Ezeiza. Aerolineas over the last year has resumed several domestic routes and regional international routes at Ezezia, enabling domestic-to-international connections without the hassle of switching airports. The new Ezeiza short-haul flights also allowed Aerolineas to improved connections with the six SkyTeam carriers serving Buenos Aires. Mr Lafosse says 35% of Aerolineas’ long-haul passengers now connect at Ezeiza. He says the number of passengers making domestic-to-international connections has doubled. Aerolineas' connecting traffic has clearly benefited from Argentina’s policy of restricting foreign carriers from carrying international passengers from its secondary cities. The government has repeatedly denied requests from foreign carriers to launch services to cities other than Buenos Aires. Uruguayan flag carrier Pluna in particular was a vocal critic of this policy as the carrier was unable to expand its Argentinean network despite Argentina-Uruguay theoretically being an "open skies" market. Pluna’s business model relied on connecting secondary cities in the southern portion of South America with 90-seat regional jets via Montevideo, in particular cities in Argentina and Brazil. In the end Argentina’s restrictive policy was partially responsible for Pluna suspending operations in Jul-2012. Sadly the restrictionist approach has worked, at least insofar as Aerolineas significantly benefiting from the demise of Pluna. The carrier has doubled its operation to Montevideo and now operates eight daily flights to the Uruguayan capital. Aerolineas has been able to absorb most of the passengers that flew Pluna between Uruguay and Argentina as well as between Argentina and Brazil. Aerolineas is consequently now the largest carrier in the Uruguayan market. Buenos Aires Aeroparque-Montevideo is also the carrier’s largest route in terms of seat capacity and frequencies. Panama’s Copa also has been denied attempts to launch service to Rosario and Mendoza, Argentina’s third and fourth largest cities. Copa now serves Buenos Aires and Cordoba, Argentina’s second largest city, and offers a significant number of one-stop connections to Central America, North America and Caribbean via its Panama City hub. Given the success Copa has enjoyed in Cordoba the Argentina government is concerned that if Copa flew to other Argentinean cities such as Rosario and Mendoza fewer passengers would connect in Buenos Aires with Aerolineas and instead opt to fly Copa. Argentina’s government would react similarly if other Latin American carriers, such as TACA Peru or LAN Peru, attempted to launch service to Mendoza or Rosario. The government prefers to force passengers originating or heading to western or northern Argentina to backtrack via Buenos Aires and fly with Aerolineas, even though the economies of these regions would benefit from foreign carriers being provided unfettered access. Not surprisingly, some Latin American carriers and Latin American airline association ALTA has been critical of Argentina’s protective policies. For the second consecutive year, Argentina was a hot topic at the ALTA Airline Leader Forum in Nov-2012. ALTA president and Avianca-TACA chairman Roberto Kriete during the CEO panel was particularly vocal criticising Argentina’s government for being manipulative and not properly managing Aerolineas. Latin America’s leading airline groups are right to be frustrated with Argentina, along with Venezuela standing out as countries blocking the region’s otherwise healthy aviation industry from realising its full potential. But turning around Aerolineas is a daunting task and the flag carrier would quickly fail under a totally liberal regime. If Aerolineas can be successfully turned around, the overall Latin American industry would benefit and the flag carrier could potentially join the region’s other leading airline groups as publicly traded entities. It now seems impossible to fathom given the current situation but Argentina, assuming a stronger and healthy Aerolineas, could potentially reconsider its current protective policies and liberalise the market – particularly if a new government comes to power.